I definitely got a runner’s high tonight after running 2 miles on the treadmill and walking 1/2 mile. What a good feeling! I told my husband that running is starting to clear my mind more than meditation. It definitely helps me sort my thoughts about the day out. 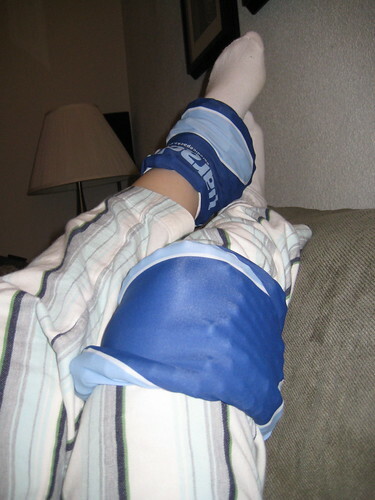 Once home, I showered, changed into my jammies and iced using paradice ice packs. 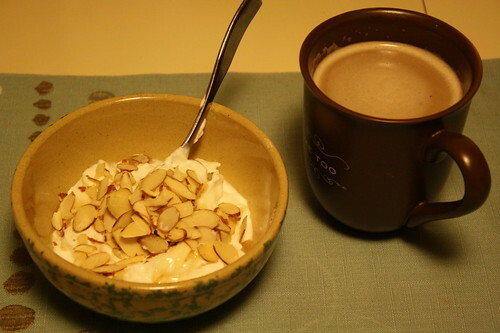 Breakfast was chobani greek yogurt with almonds and honey. I realize I have been pretty boring with my food lately, but I am trying to eat up what is in our fridge and not waste it! 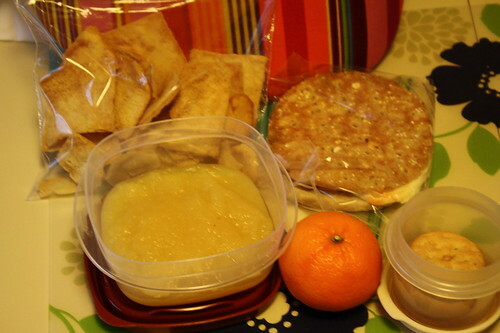 Lunch was a ham sandwich, applesauce, a clementine, some pita chips and two girl scout peanut butter sandwich cookies. I realize that sounds like a lot of food! 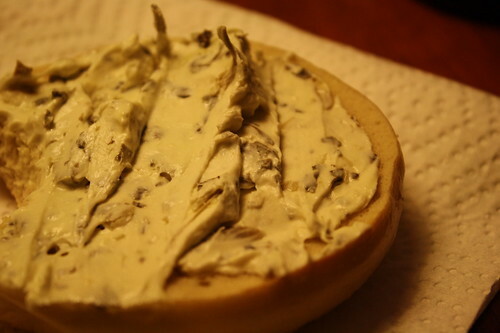 I sort of snacked on the pita chips prior to lunch though. By the looks of this very brown themed lunch, I need to go grocery shopping for some veggies soon. 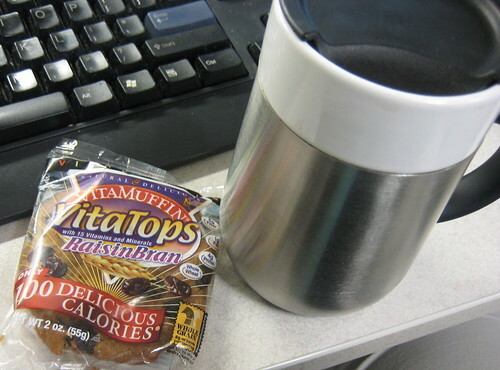 My afternoon snack was a raisin bran vitatop and a half a cup of decaf coffee. The coffee tasted yummy, especially because it was a dreary day in Milwaukee and coffee comforts me on rainy days. 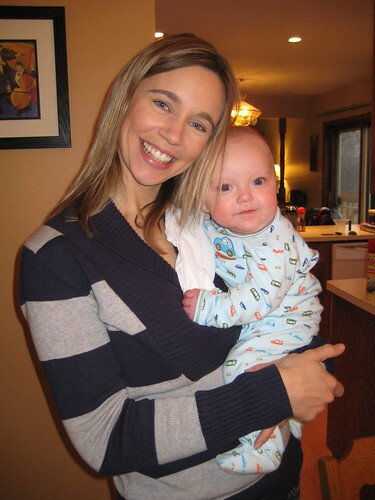 I really liked the raisin bran flavor–so good! Dinner was late, when I got back from the gym. 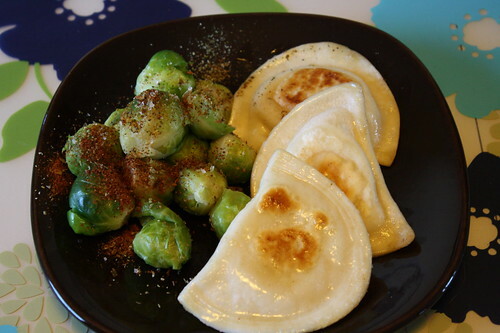 I needed something quick but relatively nutritious, so I cooked up my go to meal of late, pierogis and brussell sprouts. I cooked up this meal quickly while watching Food Revolution. 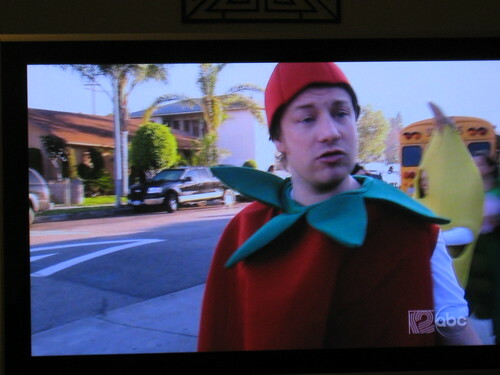 Jamie always inspires me and makes me laugh, especially when he shows up in a tomato costume. Rumor on the radio today was that he does eventually get into LA schools and the LAUSD gives in. It’s about frickin time! Anyone else here this shocking food news today? The NY Times headline read: “Vegan Promoter Uses Photos of Meat and Dairy items and fury follows.” How disappointing for the readers of VegNews. Hope your Tuesday was fantastic! I have been spending more time with the treadmill at the gym this week. I have purposely been running more to test out how I do with it. I think I’ve been doing pretty good, at least starting out with these low miles again. My knee sort of bugs me and I get side aches a lot, but I am sure that with proper training and everything, I can do a 10k in a couple of months. 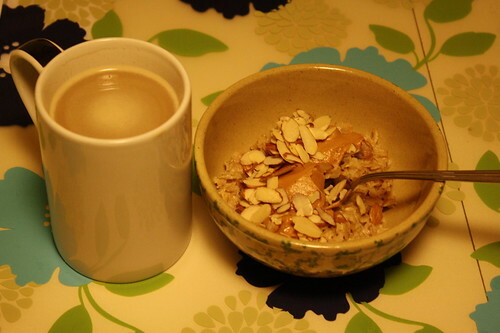 I was in the mood for oatmeal this morning, so breakfast was stovetop oats with peanut butter. I added some cinnamon to spice things up but without a ripe banana, these oats were just ok. 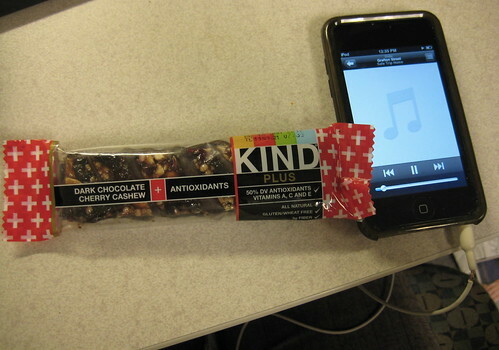 Snack at work was peppermint tea and half of a Kind bar. I am on quite the peppermint tea kick lately. It has no caffeine of course, but the peppermint perks me up during a mid-morning break from work. While snacking, I read the article I posted earlier today about Wisconsin food and knew I would have to share it with you readers. 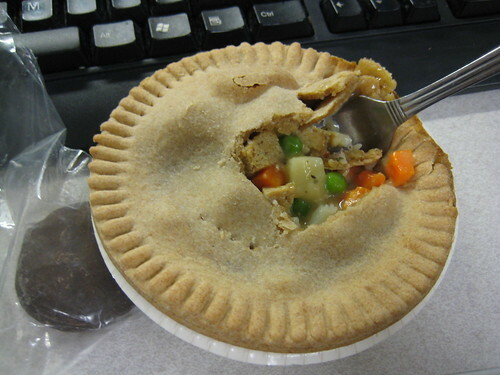 Lunch was an Amy’s vegetable pot pie and two oreo cookies for dessert. 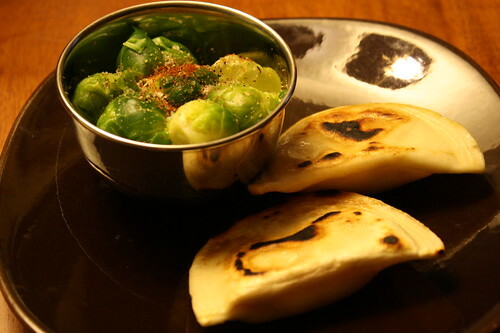 Dinner was three pierogis and brussell sprouts loaded with Penzey’s spices. Thanks to Anne’s post today, I learned a lot about brussell sprouts and craved them for dinner. 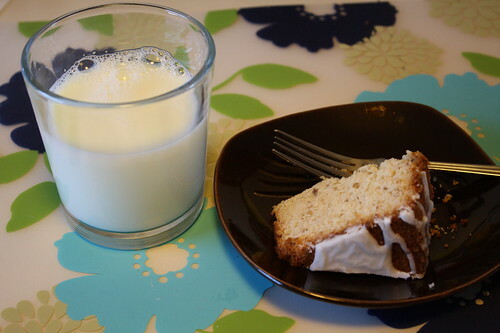 Dessert was some really yummy almond cake made by my mom with some skim milk. Workout: I let my stomach rest and then got to the gym. I biked while reading Health magazine for 20 minutes; ran and walked on the treadmill for 15 minutes and lifted some weights. I also did some abs and major stretching of my legs. I’m enjoying the book so far and am looking forward to discussing it at the New Berlin library’s food program in two weeks from tonight. It’s reading and then bed time for this foodie! I got up somewhat early today, read the ads in the newspaper, watched CBS Sunday morning and got ready to leave the house to drive forty minutes away for brunch at my friend’s house. 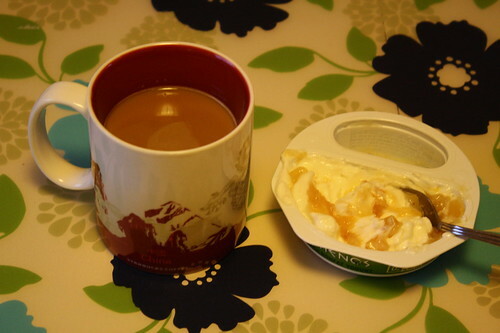 I knew I couldn’t wait to eat brunch after 10 a.m., so I had some coffee and an Athenos greek peach yogurt before leaving. 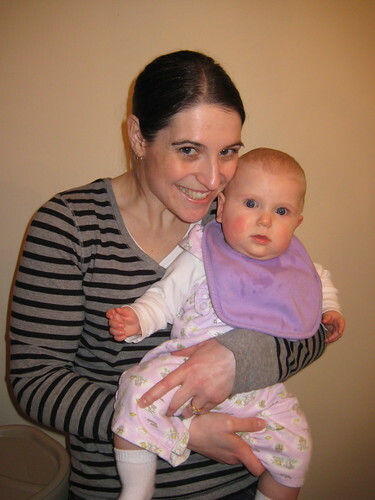 At my friend’s house, it was fun to visit with the girls and see two of their babies. My brunch plate. I went back for some more french toast and strawberries. 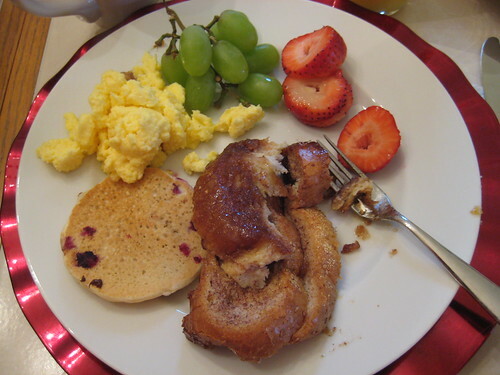 Enjoyed it with more coffee and orange juice. Us girls visited into the early afternoon, mostly concerned about some very serious matters in the world. I guess being 30 years old and over makes us concerned about such things. We still discussed fitness, beauty and nutrition too (topics dear to my heart of course). After visiting, I drove to my parents’ house because they live out that way in the country. 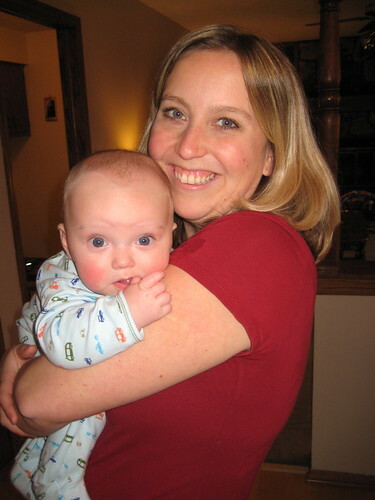 My mama fixed some of my clothes, so I was picking those up–she hemmed pants and patched holes. I cannot sew for the life of me and she has a nice sewing machine and is a quilter. We visited for a while and on my way home, I realized that my afternoon of talking left me with a very sore throat that is still lingering. It was a dreary day here and the rain and clouds made me want to go home and curl up on the couch. I sort of did that and read magazines, a book, we finished watching Despicable Me and now I am enjoying Amazing Race. I didn’t feel like anything sweet for dinner, so I had half of a plain bagel with spinach artichoke cream cheese and then Craig made pierogis, so I just had a plate of two of those. Brunch really left me full for much of the day. Better go watch my show and check blogs during commercial breaks! Not ready for the week to begin again. I feel like I had a productive and nice weekend though spent visiting with family and friends. Hooray–signs of spring were everywhere today! I went for a walk around the block for a break during my work day and didn’t wear a coat because it was near 60 degrees out. 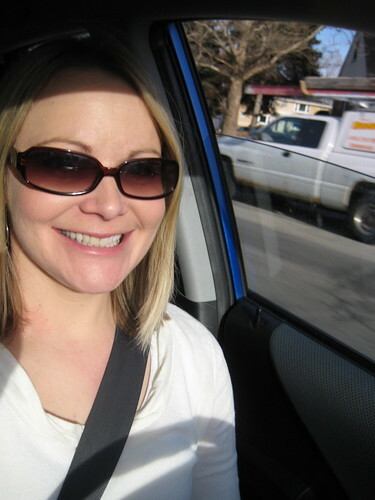 I left work with the windows down and enjoyed the sun beating down on my face. The snow is FINALLY melting bit by bit. Craig and I went for a walk around our neighborhood for the first time since November. There were birds chirping in the trees and I saw and heard a beautiful robin chirping in the tree above us, which made me so happy. 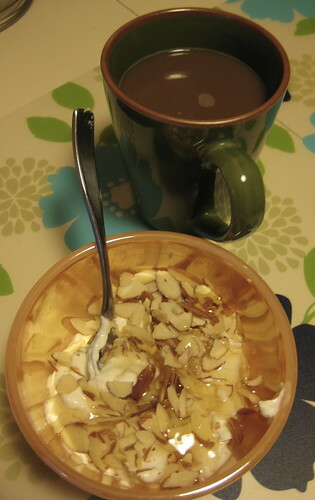 Breakfast was Chobani plain non-fat greek yogurt with sliced almonds and honey. 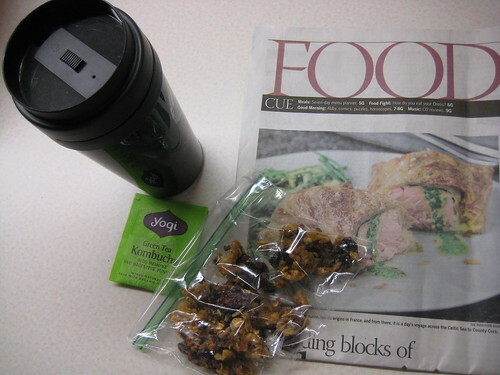 Snack at work was the granola bar I made on Sunday plus a yogi green tea kombucha. I read the Food section of the paper while I took a break with my snacks. 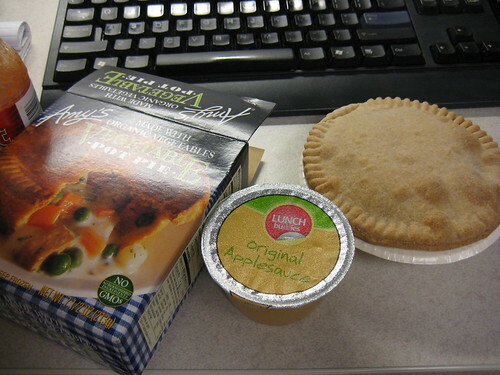 Lunch featured an Amy’s vegetable pot pie, an applesauce and a Kind Dark Chocolate cherry cashew bar because I wanted something sweet. It was a yummy flavor! Very dessert like and hard to stop eating. This one featured 14g of sugar, 4g of protein and came in at 180 calories. Total fat was 9 g.
After work, I decided to run some errands and use this as my rest day instead of heading to the gym. I went to Kohl’s to use a coupon that expired today. 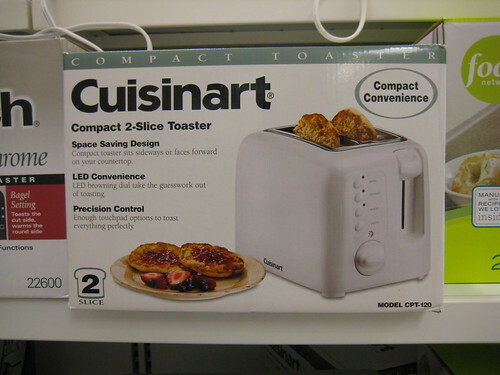 I also shopped for toasters and took a picture of this model to do some research on it. We need a new toaster badly, but my husband and I are both researchers, so I need to look some models up online before buying. Oh and I need the magical 30% off Kohl’s coupon before I consider buying a toaster from Kohl’s! I also ran to Target for some other things. Per usual, I spent about $50 on random things after I just went in for some laundry detergent, toilet paper and febreeze. I finally broke down and bought some Cadbury mini eggs, so I snacked on those when I got in the car. They are my favorite Easter candy of all time. 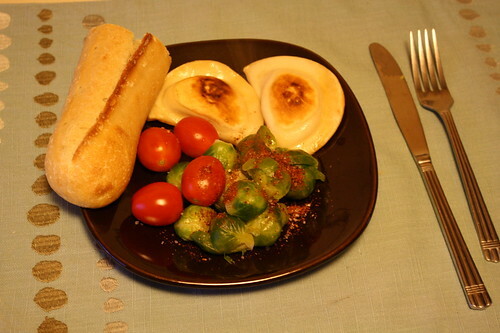 Dinner was two pierogi with brussell sprouts, tomatoes and part of a french baguette. Dessert was a mint chocolate chip ice cream sandwich. I’m really tired & have a headache (which I rarely get), so I am going to sign off now, read my book and go to bed early tonight.